There’s no Brooklyn Bridge in Sparks, Nevada, but there is a Grimaldi’s. Grimaldi’s, as you may know, is a highly regarded New York “old-school” Pizzeria whose original location is directly under the Brooklyn Bridge (on the Brooklyn side). 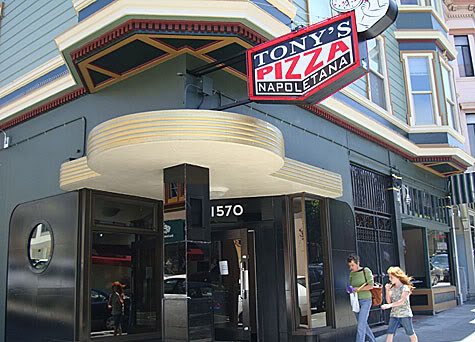 It has built an excellent reputation for turning out classic coal-fired New York style thin crust pizzas. Grimaldi’s was founded by former employees of Patsy’s (which some say has the best pizza in NYC) and while it may not be the best, it often ranks in the Top 10 pizzerias of NYC which is no small feat. Grimalid’s has now expanded to over 30 locations across the county and one of them, luckily enough, just so happens to be located at The Legands Mall is Sparks, NV. If you are in the Reno area and craving an authentic, coal-fired, thin-crust New York style pizza. Look no further. Head directly to Grimaldi’s because while this location may be relatively brand new and thousands of miles from Brooklyn, they are cooking it old-school New York style here. As I said, Grimalidi’s pizza’s are coal fired. Coal firing is a feature you will most often find in old-school East Coast pizzeria’s, especially in the New York/New Haven areas. While Neapolitan purests insist wood is the only way to go, Coal has many of same benefits of wood (smokey, earthy aftertastes) and is often hotter than wood ovens which some claim produces better textures. Coal (and wood) ovens are expensive to fire, clean and maintain, and that’s why you don’t see that many of them out there even though most people would agree they produce better pies. 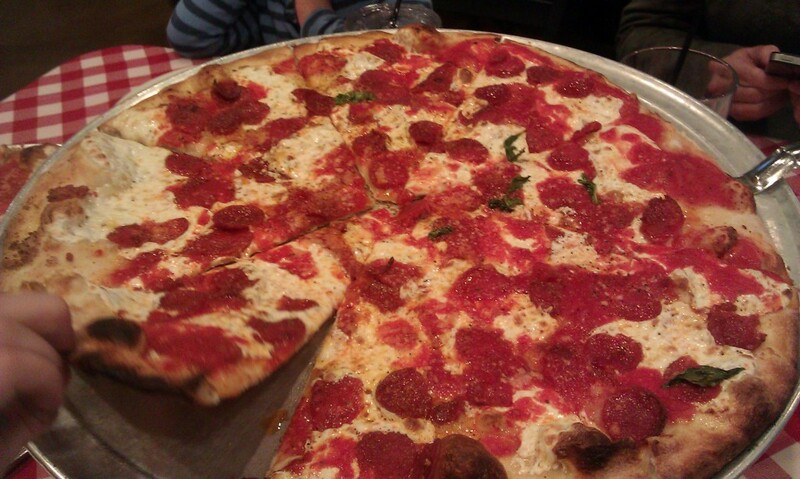 Grimaldi’s version of coal fired pizza produces a light, crisp, yet chewy thin crust with good bubble structure. 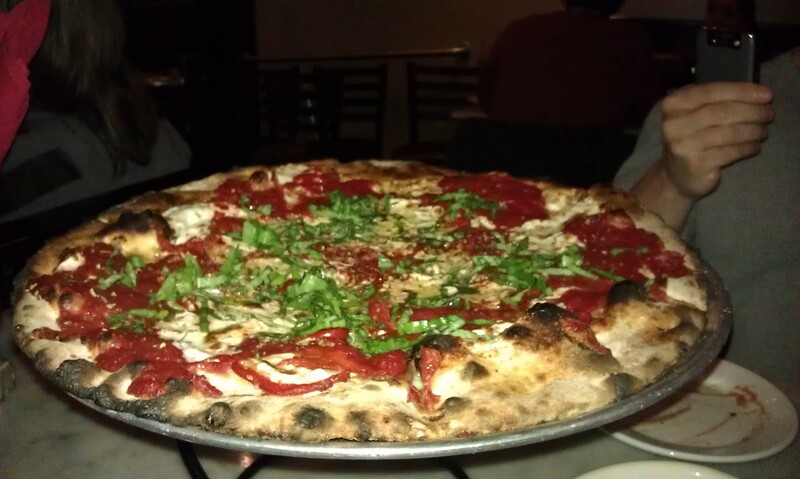 Grimaldi’s also claims to have a special “secret” sauce and uses hand made mozzarella cheese. The sauce is actually quite good and the ingredients, including the cheese are 1st rate. I particularly liked the pepperoni. Not only was the pepperoni itself of high quality, but I find that the intense head of coal-fired ovens tends to crisp-up the edges of pepperoni perfectly. The restaurant is located in the southwest corner behind Scheels. It is a sit down casual restaurant with full table service. There’s no outdoor dining but plenty of seats inside. The menu includes a few salads but beyond that it is just pizzas. There is a good selection of beers and wines as well. Service was reasonably fast, friendly, and efficient. After you are done shopping at Scheels, be sure to head here! Large pizza’s (18 inch) are a surprisingly low $16 which is a very good deal given that it’s below what most other pizzeria’s charge for a large despite Grimaldi’s having the higher costs of the coal-fired oven and high quality ingredients. 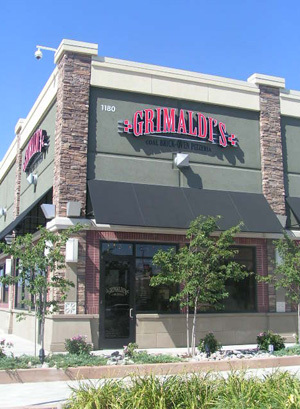 Overall, Grimaldi’s is a fantastic addition to the Reno-area pizza scene because it provides a top tier, authentic old school New York style coal-fired pizza at a very reasonable price without having to drive 3,000 miles to get it.